In November 2017, I wrote that the idea of having a second EU referendum was a “superficially-attractive option with very high stakes”. So it still is, and I stand by everything I wrote a year ago about the risks and dangers of a second referendum: including the risk that Leave might still win. We do know a lot more now about how the Leave campaign unlawfully gathered data uon UK voters, how they used that data to target adverts on Facebook, and how they illegally overspent the limits set by the Electoral Commission. For the purpose of this blogpost, I’m going to suppose that I might be a Conservative Prime Minister. By heritage and upbringing, I am a natural Labour voter: I’m a trade union member, my dad was a trade union member, his dad was a trade union member, and so on back to my great-grandfather: further than that family legend can’t tell me. Further, since the Tories imposed the poll tax on Scotland, if not before, I’ve always been clear that I would not only never vote Tory, in FPTP elections I’d always vote for the even-slightly-leftier candidate with the best chance of beating the Tory. So hold my hand: this is a big jump. Last week, I wrote and posted a series about the four possible directions the UK can go from where we are. fourth, Parliament voting to revoke the invocation of Article 50, which means an unprecedented rebellion of MPs in both Opposition and Government with unpredictable consequences. From a worm’s-eye perspective, the fourth option is least-worst: but the people most likely to face negative consequences for carrying it out and saving the UK from catastrophe or disaster, are the same MPs who would have to vote for it. And regardless of how bad it is for us in the lower income bands, MPs are all in the top ten percent by income just from their salary: they have a generous expenses system, heavily subsidised food and drink at work, complete job security until the next general election, and a nice golden parachute even if they lose their seats then: they will not directly suffer from the economic disaster of soft Brexit, and though the catastrophe of hard Brexit might hit them, they’re better insulated against it than most. 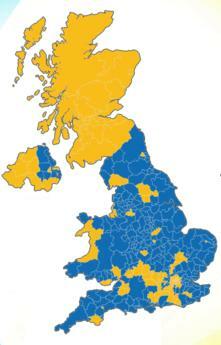 I think the UK will vote to Remain in the European Union today. I have no confidence that it will do so by a large margin. The last poll from Ipsos Mori, based on telephone polling done over the last couple of days, shows 52% for Remain, 48% for Leave: the poll of polls shows a Remain majority. More telling still, 74% of those polled expected Remain to win. What will happen if Remain gets the majority? 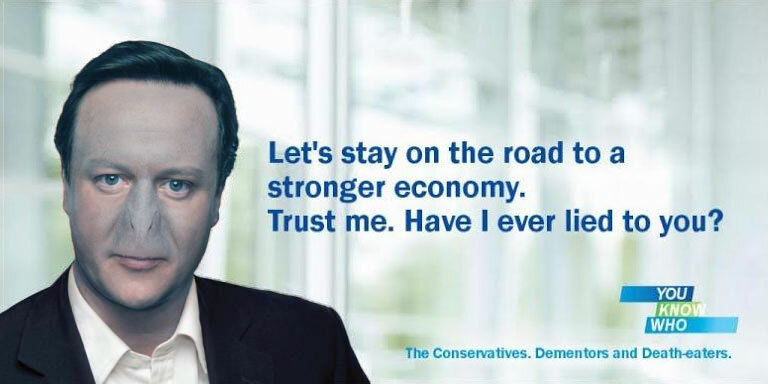 David Cameron remains Prime Minister until he chooses to step down – which, as we already knew, he planned to do before May 2020. He held the referendum to keep his Brexit MPs with the Tory party, and by their own boys-club rules, he’s won. He undoubtedly expected to be part of a Tory-LibDem coalition and to use the referendum as a trading point with his coalition partners, and keep his unruly anti-EU MPs and Ministers quiet in that way, but having won his point, I doubt if he will see many Brexiters go to UKIP: the Tory party has a talent for power and unity. One genuine upside: Iain Duncan Smith has lost his place at the Department of Works and Pensions, and I very much doubt he will ever get it back. It’s difficult to think of any politician who has been more dishonest or more incompetent, and reputedly David Cameron had tried to edge him out at the last couple of reshuffles, but IDS sat tight. He was tempted out with – I’d guess – the hope that if Leave got the majority, the Tory party would once again recognise his gift for leadership as they did in 2001, and make him their leader and Prime Minister. There will be no other referendum on leaving the EU for at least ten to fifteen years: the conditions required were odd in the first place, and I don’t think any of the parties except UKIP would have stomach for another. Which brings us to UKIP, the party which will benefit most from a Remain majority. They retain their main income source, the MEPs who don’t like Europe, and they are in the lovely situation where they convinced nearly half of the British electorate to vote based on lies, without having to be in a position to take responsibility for them. Because the UK will not leave the EU, the Leave campaign can continue to push the idea that all of the austerity-fuelled cuts to public services are the fault of too many immigrants straining the system: they can continue to push the idea that immigrants are to blame for the housing shortage: they have no reason to stop this, now they’ve established so many white voters are gullible enough and racist enough to believe it. And while David Cameron didn’t want to leave the EU, he certainly sees the benefit of having a built-in group of vulnerable minorities who can take the blame for his own policies. What will happen if Leave gets the majority? I think this is unlikely, but it’s worth remembering: this EU referendum has no legal trigger. Neither the government nor Parliament was required to do anything as a result of a majority of UK voters deciding they wanted out of the EU: it’s effectively a giant opinion poll, no more binding than a petition to Parliament. What many Leave voters were expecting to happen was that they’d wake up on Friday 24th June and discover the UK was no longer in the EU and their lives would get better because there’d be more money to spend and fewer foreigners around. In fact, even if the EU referendum did have a legal trigger, all that could happen would be that the UK Government would invoke Article 50, and then 27 other EU countries and the EU Commission would spend two years negotiating with the UK on the conditions to be set for the UK to leave the EU: those conditions to be ratified by a vote of the European Parliament. The negotiators for the UK would have to choose between the UK no longer having access to the European market of free trade – which, combined with the loss of the money that flows into the UK from the EU, would likely trigger a recession – or to accept that if the UK were to continue to have access to its biggest market, the UK would have to accept being part of the Schengen free movement area, as Norway and Switzerland have, and to accept that the UK would be bound by all EU laws and regulations – while losing any UK input into those laws and regulations. Given that most Vote Leavers appeared to be inspired by a toxic mix of xenophobia and imperialism, I do not imagine that – if Leave gets the majority – the price of access to the EU common market would be acceptable to them. But it would most likely be what they’d get. And having left the EU, now poorer and seeing their services failing still further without any EU financial support, but with EU immigrants continuing to enter the UK freely and EU regulations still paramount, wouldn’t that make UKIP stil more successful? But I think that today, the majority will vote to Remain. Why can’t the BBC see Green? The BBC has decided that UKIP is, in Scotland, now electorally equivalent to the Scottish Greens, and should receive similar election coverage for the 2016 Scottish Parliament elections on 5th May 2016. In doing so, the BBC Trust doubtless hope that pretending in advance that UKIP is a major party in Scottish politics will make them so. I am a member of the Scottish Green party, since June last year. What follows, however, is an unexciting post full of statistics on the relative support of UKIP in Scotland versus the Scottish Greens.